No one can deny the undeniable success of Estelle’s “American Boy” which is a collaboration with Hip-Hop mogul, Kanye West. I bet that the song is played in every bar across Europe, USA and Asia but did Estelle do a nice-follow up single for “American Boy”? I bet she didn’t. 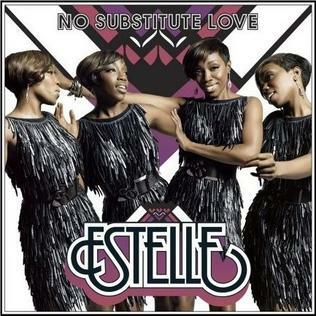 Last June 30, Estelle released her 3rd single titled “No Subsitute Love” which features samples from George Michael’s “Faith” and Lindon Roberts’ “Subsitute Lover”. The song is incorporated with her usual soulful voice and a little bit reggae vibe added onto it. Nevertheless, it’s quite a good song but not a single material compared to “American Boy”. Estelle made a vulnerable entrance into the world music scene when her single “AB” went straight to number 1 in the UK singles charts last April but this song is quite a flop because it only managed to peak at #30. The song surely didn’t quite made into the high expectations made through the impression of her delivering good songs aside “AB”. Estelle’s vocals are a little bit off the mark as she delivers the song with a thin, more-falsetto voice that made the song a lot worse than we expected. This entry was posted on July 29, 2008 at 5:26 pm and is filed under Single Reviews with tags Estelle, No Substitute Lover, Shine. You can follow any responses to this entry through the RSS 2.0 feed. You can leave a response, or trackback from your own site.